We are the leading supplier and dealer of Industrial Ball Screw Bearings in Chennai. We trade and supplyIndustrial Ball Screw Bearings from chennai to all over Tamil Nadu, Andhra Pradesh, all states in India and Exports. Creating a niche of Industrial Ball Screw Bearing such as Ball Screw Bearing and Ball Screw support Bearing at its best, with utmost quality. Owing to their excellent performance, longer functional life and superior quality, these Industrial Ball Screw Bearings products are highly demanded by the customers. The new threaded self-aligning nut, a combination of lead screw nut and spherical bearings, in which the thread is introduced directly into the spherical ball, primarily allows the compensation of manufacturing and installation tolerances. 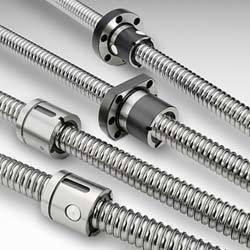 Available with us is a precisely engineered Ball Screws that are extensively used in various industries such as engineering and automobile. Efficient in converting of rotational motion to linear, these products are designed to meet the variegated demands of the customers. Owing to their excellent performance, longer functional life and superior quality, these products are highly demanded by the customers. 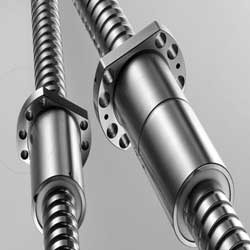 We are one of the prominent names involved in offering a commendable range of Ball Screw Support Bearing. Extensively used in various applications such as machine tools, electrical and automobiles, these products are manufactured at our vendors' end in compliance to international quality standards. Available in various sizes, these products are highly appreciated by the customers owing to their corrosion resistance, resistance to wear and tear, high functionality and durability. Looking for Industrial Ball Screw Bearing ?